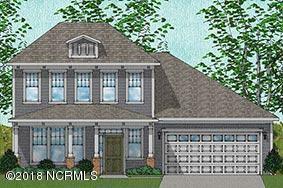 Our Newbury C two-story home features 4 bedrooms and three-and-one-half baths. This home includes a downstairs owners suite with a 5 foot tile walk-in shower, quartz counter top, trey ceiling and large walk-in closet. Flex room that could be a dining room or home office is also on main level. The kitchen and breakfast area are open to a large, centrally located family room. A laundry room and powder room complete the first floor. Three secondary bedrooms are located upstairs alongside a spacious loft and walk-in storage room. Other features in this home include granite countertops in kitchen and quest bath, craftsman trim, and sunroom located off of family room. Listing provided courtesy of The Newman Group of Coldwell Banker Sea Coast Advantage-Cb.